Request a product that isn't listed. At John Eley's we can supply all your big print requirements. 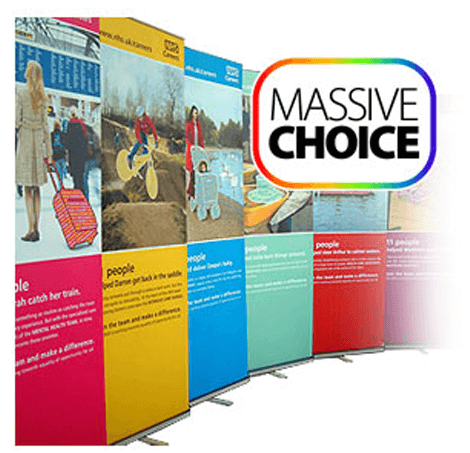 From posters to pop-ups, PVC banners and vehicle graphics. In fact the chances are if you can think it then we can print it! Sign Makers and Graphics manufacturers and providers of Screen Printing and Digital Print services for all types of industries including · Arts / Crafts · Academy's · Automotive · Accountants · Beauty · Cafes / Restaurants · Charities · Construction / Resources · Decorators · Delivery / Transport · DIY · Education · Entertainment / Media Events / Entertainment Industries · Fashion / Clothing · Financial · Food / Drink · Health / Fitness · Home / Furnishing · IT Services · Jewellery · Law / Professional · Local Council · Marketing · Music · Photography · Plumbers · Property · Publications · Recruitment · Retail · Schools / Academy's · Sports · Medical Services · Shoes · Travel / Holiday / Hotels. © JOHN ELEY SIGNS. ALL RIGHTS RESERVED.